I always thought that Spain was the country where football awoke more passions. We are, in fact, passionate people with this mediterranean character that makes shouting, gesticulating and laughing really loud part of our idiosyncrasy. However, there is a thing we don't do: we don't decorate our houses with football motifs. Maybe a truly big fan could put a scarf of his/her favorite football team near the television while watching an important match, but what we certainly don't do is decorate the facades. Well, here they do and they are great in doing so. The funny thing comes when you also see some people wearing orange clothes and accessories (and not only on the day Holland is playing but during the whole competition), flags raised at the top of some houses with the slogan "Hup Holland Hup", orange bouquets at the flower shops and special tarts and cakes with orange football motifs at the supermarkets. Even for every €15 purchase at Albert Heijn (the most famous supermarket in the Netherlands) you get a little lion, called "Welpie", which is of course the dutch soccer mascot. They even have a funny advertisement where everybody uses Welpies to cover every sort of things. Naturally, Welpie's hair is orange, but there are also another versions with blue, white and red hair and guess what... those are the colors of the Dutch flag! Siempre pensé que España era el país donde el fútbol levantaba más pasiones. Somos bastante pasionales, con este caracter mediterráneo que hace que gritar, gesticular y reir bien alto sea parte de nuestra idiosincrasia. Sin embargo hay cosas que no hacemos, como decorar nuestras casas con motivos futbolísticos. Quizá un auténtico fan ponga una bufanda de su equipo al lado de la tele mientras ve un partido importante, pero lo que sí que no hacemos es decorar las fachadas de nuestras casas. Aquí lo hacen, y lo hacen muy bien. Lo genial viene cuando descubres que también visten de naranja incluso cuando no hay un partido de Holanda ese día, que hay banderas con el lema "Hup Holland Hup" en lo alto de algunas casas, que venden ramos de flores naranjas y que en los supermercados hay pasteles y tartas naranjas con motivos de fútbol. Incluso, en Albert Heijn (el más famoso supermercado de Holanda) te regalan un "Welpie" por cada 15 euros de compra. Welpie es un pequeño leoncito que es la mascota para apoyar al equipo holandés. Incluso han hecho un anuncio muy divertido en el que todo el mundo usa Welpies para forrar todo tipo de cosas. Por supuesto, Welpie tiene el pelo naranja, pero también hay otras versiones con el pelo azul, blanco o rojo y adivinad por qué... ¡son los colores de la bandera holandesa! I should take a picture of a colleague who has painted all her nails in orange except for one, painted with the Dutch flag. I'm also living in the Netherlands and it's really funny seeing everything orange! I have seen some men in dark suits on their bicycles with some Welpies on. I like the flags on the car's windows too. Absolutly nobody was on the street at the time Holland was playing. And because dutch people is very friendly, most of them are supporting Spain now that they are out of the championship. Regards to all the expats! tnarik - It's already uploaded ;-) and I saw that it took less than 1 hour to have your own Welpie! Well done! Now you are a real suppporter! ricardo gimeno - Mmmm I am not sure if it is because of that but it's true that Dutch people are very good at sports!! 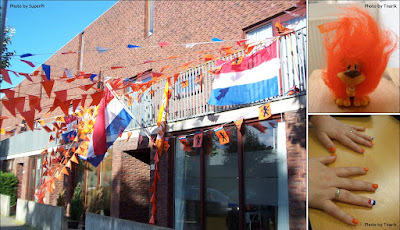 anónimo - I've read in Dutchnews.nl that half of the country is now supporting Rusia. Why? Because the trainer is Dutch and I guess that also because is less humiliating if the team that has beaten you is the one who wins at the end. Confirmado: tras retirar a los welpies de la circulación, los holandeses nos han apoyado. Ayer visitas de vecinos, llamadas, etc. Hoy hasta la becaria holandesa vistiendo la roja! juan manuel e.r. La verdad que ha sido espectacular, y no sé pero me da la sensación de que nunca antes había estado la gente tan volcada con el fútbol. O me lo parece a mí.